I am reading Brennan Manning's The Furious Longing of God. I haven't made it far in the book, but already it is positively amazing me. This is a man that I can relate to. His heart seems to be shaped and molded much like mine. 3. Mispronounces at least one word in a five minute conversation. 2. Am uncomfortable with the male race...seriously. 3. Uncomfortable in my own skin, truth be told. 6. Sees with war-tinted glasses instead of rose tinted ones. Sounds less violent than it actually is. 8. The extreme desires hidden in my heart to be something amazing in this world...changing it. 13. The amount of tears I've shed over a lifetime...but how glad I am that God knows. 15. How much it hurts to think about not being loved and truly known. 20. The woman I wish I could be. 1. The god who doesn't care about what's hidden in my heart: all the hopes and dreams, sadness and fears. 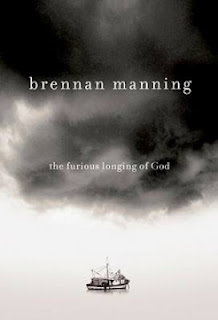 Click here for a free Amazon download for The Furious Longing of God. Sweet Gia. There are so many amazing and complicated layers to who you are. I think I have only scratched the surface of the surface. But I can't wait to get to know you on a deeper level! You are truly amazing, talented, creative, colorful, and a little bit weird (in a good way!) I'm so glad to be your friend!